The Real Pigeons are a crimefighting squad of city birds, each with a unique Pigeon Power. Grandpouter is the patriarch in charge of super-strong Frillback, extra-bendy Tumbler, navigational expert Homey and the newest recruit, Rock, a master of disguise. 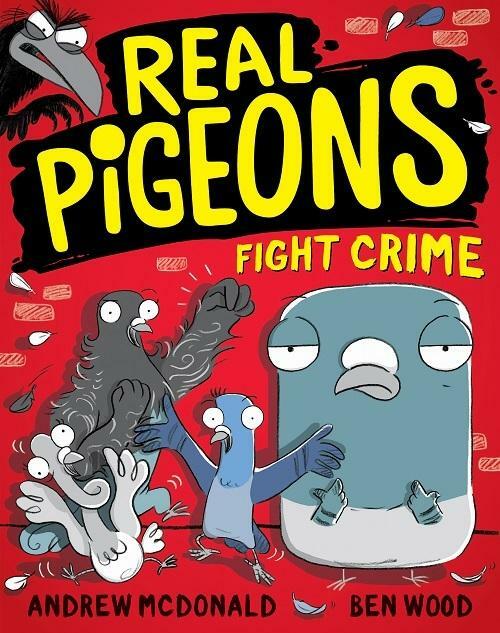 Real Pigeons Fight Crime is the first instalment in the Real Pigeons series, with a trio of short, illustrated mysteries that will make you fall in love with these feathered protectors. The Pigeons meet regularly in a bin, endure long stakeouts and enact creative plans to vanquish breadcrumb thieves, protect the park bats and avert disaster at a food-truck fair. Each story is divided into manageable chapters with a genuine mystery to solve, and quirky surprises such as a monster crow, a fortune-telling budgerigar, a walking scarecrow and more. Text and pictures work together seamlessly, with comic sequences, graphic dialogue, funny captions, exuberant visual humour and word play. By the end of this first book, crow-power conservative Jungle Crow and fame-obsessed Mega Bat are shaping up to be excellent and not-too-scary nemeses. I can’t wait to witness more of the Real Pigeons’ ingenuity, bravery, teamwork, and general silliness. Readers aged 6+ with a sense of humour, a love of animals and sleuthing skills will adore this entertaining new series.